A suspect is being held at the Sacramento County Jail after a vehicle stop led to the discovery of loaded handguns. 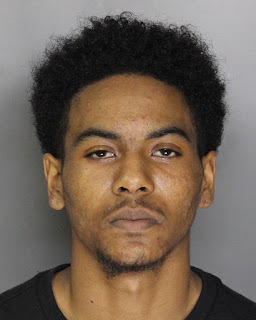 Yesterday afternoon Elk Grove Police stopped a car being driven by 19-year old Bradley Earle Wint (pictured above) of Sacramento for a vehicle code violation near Ranfurly Drive and Trenholm Drive. Upon contact, the odor of marijuana emanated from inside the vehicle and Wint was detained. A search of the vehicle led to the discovery of two loaded handguns under the driver's seat. Officers also recovered marijuana and indicia of sales from inside the vehicle. Wint was arrested and booked into the county jail where he faces three felony charges and is being held without eligibility for bail on a Penal Code 1275 hold because of the seriousness of the alleged crime. The suspect's arraignment will be Thursday afternoon.